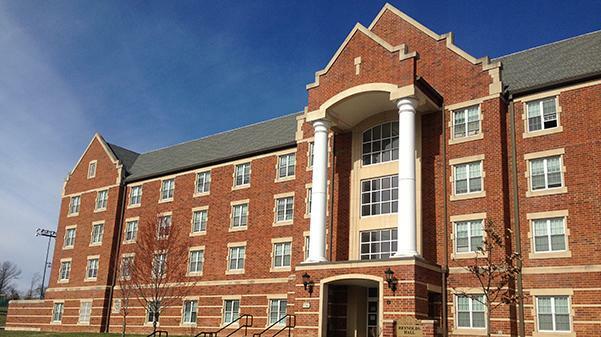 Lindenwood’s area coordinators are demanding the reversal of a policy that prevents them from living on campus with their families, which they say discriminates against them. Area coordinators are full-time employees of the university and oversee and manage the residences halls and campus houses. Additionally, area coordinators are required to live on campus. Ayres responded to the ACs via email on Feb. 21 saying that the issue is not a “philosophical” one, but said the university does not have the funds to make the apartments suitable for families. Ayres could not be reached for comment. The previous policy allowed the area coordinators to live on campus with a spouse, but area coordinators say it changed after Chelsie Bartley and her husband announced in September that they were expecting a child in March. Bartley, an area coordinator, had been living in Pfremmer at the time, and she claims after meeting with Terry Russell, director of residential life, and Jesús López, associate director of residential life, she was forced to move in January from her dorm apartment to a house, despite not asking to and not wanting to. Leong said Bartley worries about how this will impact the future of the ResLife department and the area coordinator position. Both Bartley and Leong said they were told in person that they could continue to live on campus and were “grandfathered in” because they were living with their spouses prior to the policy change. Both women requested a document confirming this but have received no written confirmation. According to documents provided by the area coordinators, a third area coordinator, Holly Zeiger, was originally told she could live with her fiancé after their wedding in May 2019. In February, Zeiger was told she would not be grandfathered into the policy. While Zeiger isn’t being forced to quit, she believes that a husband and wife being forced to live apart is unreasonable. “The idea that women cannot be both a responsible caregiver and a valuable employee creates undue conflict between them and their employer, and robs women of their earned opportunities for advancement,” their statement to Ayres said. The ACs also said that several other full-time staff members like directors and associate vice presidents at Lindenwood are required to be available in case of emergencies, but are not held to the same standard.